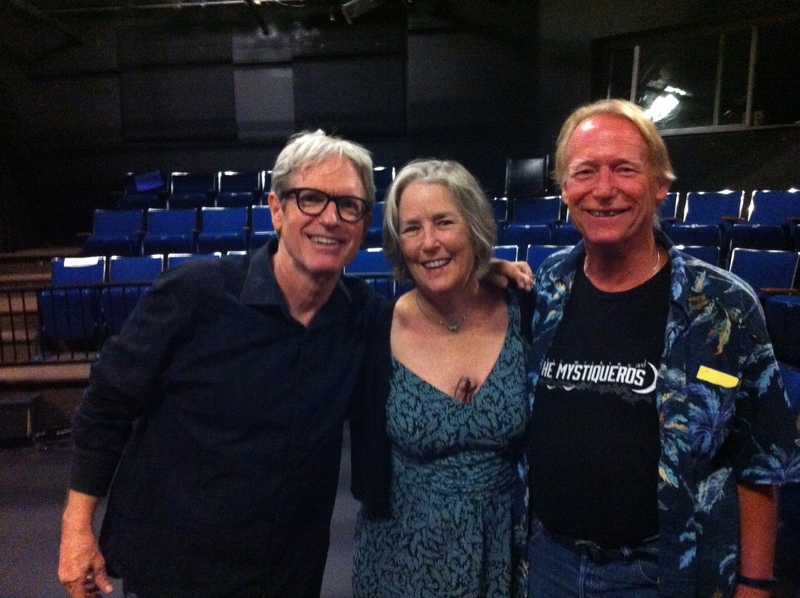 Sam Baker (left) with his friends Penny Edwards and Trey Palmer at the Columbia Center for the Arts Theatre in Hood River, Ore., on Aug. 24, 2014. No matter where Texas singer-songwriter Sam Baker performs, there’s always a chance two of his biggest fans – Trey Palmer and Penny Edwards – will be in the audience. Trey and Penny live on a lake outside of Gainesville, Fla. They are big music fans and have seen Sam Baker in concert three times in the Sunshine State. Trey also has seen him perform in five other states and three foreign countries. In the summer of 2012, Trey and Penny were on a boating trip up the Vancouver Island coastline, and Sam Baker was performing in Nanaimo, British Columbia. A Sam Baker concert near Dublin in 2008? Trey was in England and made his way over to see the show with some friends who live in Ireland. It was a similar story a few years later when Trey and Penny were traveling in England and discovered Sam Baker was performing in a small club east of London. This summer, Trey and Penny were visiting family in Portland, Ore. So, of course, Sam Baker had a weekend show scheduled at the same time just 60 miles away in Hood River. Not every concert has been by chance. Trey said he first fell for Sam Baker’s music in 2007. Trey was planning a trip to Arizona that same year to help his sister drive her car back to Florida. He knew Baker played Monday nights at a club called the Mean Eyed Cat in Austin, Texas. So he, his sister and a friend made their way there to catch Baker’s act. Since then Trey has become a true evangelist of Sam Baker’s music. He once sent out CDs of Baker’s “Mercy” and “Pretty World” as Christmas greetings. And the day before the Hood River concert Trey was working the phone, convincing friends to come to the Sam Baker show. When Baker stepped before the microphone in the tiny Columbia Center for the Arts Theatre, Trey’s local entourage included eight people, even though he lives nearly 3,000 miles away. Sam Baker was performing in Hood River with local musicians on the tuba, trombone, French horn and flugelhorn. And there were a few hiccups with the house sound system. So the early part of the show had the feel of a rehearsal and sound check. But a good-natured Sam Baker made it all part of the show, letting the audience see behind the curtain as he fixed the sound glitches and he and the quartet worked out their parts. Once he settled in, Baker’s voice and songs took over. He played the haunting “Broken Fingers” about a fateful train trip in Peru 1986. He was traveling to Machu Picchu when a bomb planted by the terrorist group Shining Path exploded in the luggage rack above his head. The blast killed a family of German tourists sitting near Baker, including a 9-year-old boy. Baker nearly died and was left with permanent hearing loss. He has limited use of his left hand after a series of surgeries. After the concert, Baker laughed at the notion that two of his biggest fans were playing their own game, stalking him on the road. “I love them,” Baker said as he hugged and kissed Trey and Penny. The next morning, I ran into Sam Baker at Dog River Coffee in Hood River, and he said was amazed how often his touring coincides with the travel plans of Trey and Penny. We also talked about how the past several months have been good to Baker professionally. Baker’s “Say Grace” also got a nice review in The Wall Street Journal. But Baker said the biggest deal was appearing in May on NPR’s Fresh Air with host Terry Gross. The interview was a big boost because it exposed Baker to the program’s large radio audience. It was still morning but already turning into a warm, summer day along the Columbia River Gorge. Sam said he was going to soak up as much of the Northwest as he could on his visit. He was picking up a fellow musician and he might drive up to Mount Hood and take some photographs before heading west to Portland. Later that night, he went to the Alberta Rose Theatre in Portland to watch his friend and fellow Texan Jimmie Dale Gilmore in concert. Guess who Sam Baker ran into in the audience? Hey Greg! These two, Penny & Trey that is, are two of our best buddies in Gnv, Fl. Now we know where they are when they’re not around and we can’t get hold of them!